The security staff you see at sporting events, festivals, concerts and other special events didn’t just show up 30 minutes before the gates opened. The event hosts did a lot of planning long before the event to ensure the safety and security of the participants and guests. If you’re organization is planning a special event that requires security, here are some tips when hiring a security firm that can help make your special event run as smoothly as possible. Your budget is obviously an important component in planning your event. However, different types of events require different levels of training and skills from the security team. Some security firms specialize in high-end security that includes highly trained, retired law enforcement and/or military personnel. Other companies may hire individuals with little training but who may appear threatening due to their size (think nightclub bouncer). And there’s everything in between. Sporting events can give rise to heated confrontations among spectators, sometimes resulting in physical fights. Alcoholic beverages being served can also give rise to rowdy behavior. In such cases, you want individuals trained to diffuse the situation and maintain peace, not escalate things. It’s also important that your security staff know when it’s time to call in local law enforcement before things get out of control. It’s critical that no matter what level of security firm you hire that it be licensed, bonded and insured. In the event of a security incident, you want to transfer the risk of damage or injury to the security firm. If you don’t, your organization and anyone involved in the planning can be held liable if allegations are made of inadequate security or personal injury by one of the security staff. You can’t expect your security team to arrive at the event 30 minutes before your event begins and get a brief rundown of what’s expected of them. Security for any size event takes pre-planning, typically months or even a year in advance. It’s important that your security firm is familiar with your local law enforcement agency, your venue, and the surrounding area of your event. It’s important to note that you may, depending on the type of event, be required to submit a security plan to your town or city in order to obtain a permit. Festivals/concerts in public parks and road races are examples of events that may require permits. Large events like these often need traffic control. Your security team may need to meet in advance with law enforcement to go over how public parking and traffic flow will be handled during the event. Outdoor events always need a contingency plan in case of bad weather. Your Plan B should be discussed in detail with the security firm long before it goes into action. Don’t forget to inform the security firm of any specific concerns you may have during the planning meeting. These could be issues such as terrorism, gang activity, or heated competitions between rival sports teams. This isn’t about your budget, but about keeping your funds secure. If you’re charging an entry fee or selling food, beverages and souvenirs, that money is at risk for being stolen. At your planning meeting ask if security staff can periodically collect funds from concessions or gatekeepers for safekeeping in a designated area under lock and key. Sadly, the chances of a guest stealing the money are much lower than those of your own staff and volunteers pocketing easily accessible cash. Injuries and illness can occur anywhere to anyone. Sporting events in particular are high risk for injuries. Some security firms supply EMTs so be sure to ask. Location of the medical tent and plans for ambulance access should be discussed at your planning meeting as well. It’s a good idea to set up a guest services area and have event staff and volunteers all wearing matching shirts, preferably with “Event Staff” printed on the back. Your security team should be aware ahead of the event of who is on staff and where guests can be pointed to in order to get assistance. It’s recommended, and usually welcomed by your security firm, that you have a post-event meeting to review what worked well and what didn’t, and discuss any problems that may have occurred that nobody thought about in advance. Your security company wants your business and you don’t want to have to shop around for another company for your next event. A review of this type goes a long way in building a strong working relationship. Source: Jeff Croissette. 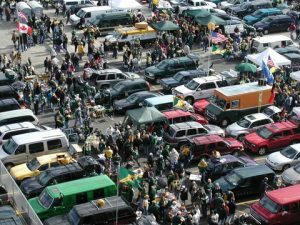 “Effective Planning for Event Security.” www.sportsdestinations.com. 26 Sept. 2016. The Directors & Officers Liability policy pays covered legal defense costs. It also pays up to the policy limit in the event of settlement or adverse jury verdict. Over the past 10 years, the types of claims that are potentially covered by the Directors & Officers Liability policy have increased dramatically as the public has become more litigious. The most common categories of lawsuits include disability discrimination under the Americans With Disability Act (ADA), player eligibility disputes, and league administrators not following their own rules or bylaws when making decisions. We have also seen claims involving breach of contract (usually excluded by most policy forms), race discrimination, violation of expression of religious freedom, failure to make all-star team, improper coaching resulting in loss of college scholarship, violation of Sherman Anti-Trust/Restraint of Trade, internal board disputes (usually excluded by most policy forms), injunctive relief to halt a tournament due to player eligibility issues (often not covered by most policy forms), etc. The Directors & Officers policy form varies greatly from one carrier to the next. As a result, a detailed review is required to uncover dangerous exclusions that would take away essential coverages. Some important policy provisions include employment practices liability and 3rd-party liability, including discrimination. Unfortunately, most insurance agents are not competent in this area. The insurance experts at SADLER SPORTS & RECREATION INSURANCE can easily guide you through such a review. Call us today at (800) 622-7370.